Space Is Limited – Advance Registration Is Required! Jeffrey has an outstanding collection of of Art Deco centered around his collection of jazz age Egyptomania, as well as French posters, art nouveau, the risque Folies Bergere, the Ziegfeld girl, and early Hollywood glamour images in vintage frames. Enjoy the nuanced period music with a live pianist. 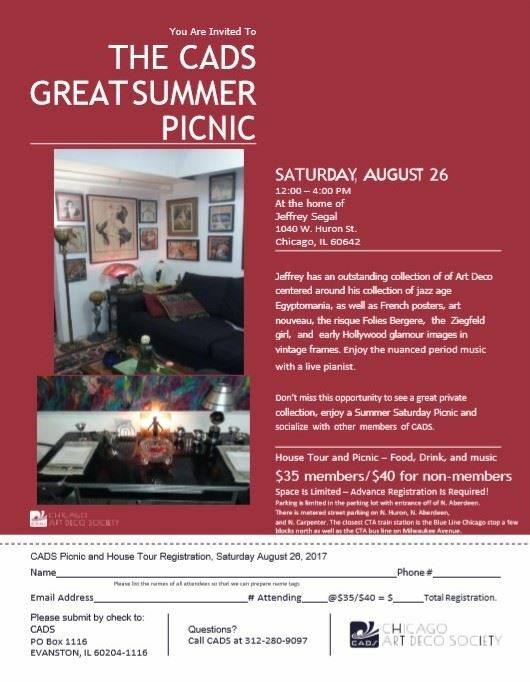 Don’t miss this opportunity to see a great private collection, enjoy a Summer Saturday Picnic and socialize with other members of CADS. Parking is limited in the parking lot with entrance off of N. Aberdeen.